A healthy turtle is a happy turtle. Box turtles are rapidly becoming one of the most popular pet turtles in North America. While it is quite common for box turtle owners to refer simply to their pet as a “box turtle,” there is an incredible variety of species and sub-species within the box turtle genus. 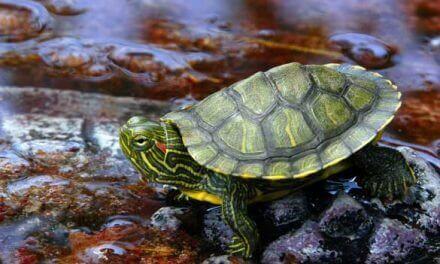 These cute and personable turtles are native to North America. With four species and 12 subspecies of box turtles to choose from, it is no surprise pet box turtles are showing up in many more homes continent-wide. Each of these various box turtle species has similar care requirements in captivity. What should I know as a box turtle owner? If you are like most new box turtle owners, you probably don’t know that box turtle care is more complicated than it may seem. This is because box turtles are literally in a category of shelled reptiles all by themselves. 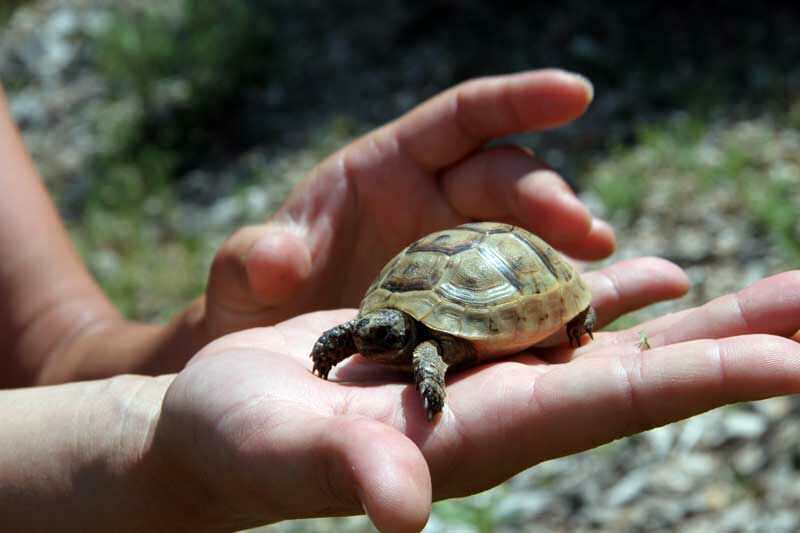 Neither land-dwelling tortoise nor true pond turtle (like their family tree, Emydidae, would suggest), box turtles need regular access to both to thrive. By learning more about box turtle care, you can make important decisions such as housing nutrition and more. While generally box turtles are not considered a good choice for those new to turtle keeping, there are ways to significantly ease your learning curve. One of the best things you can do is to start researching how to care for a box turtle before you bring your new turtle home to stay. By learning more about what type of life your box turtle would have in its natural wild habitat, you can determine whether you will be able to provide a similarly enriched environment for a box turtle in captivity. 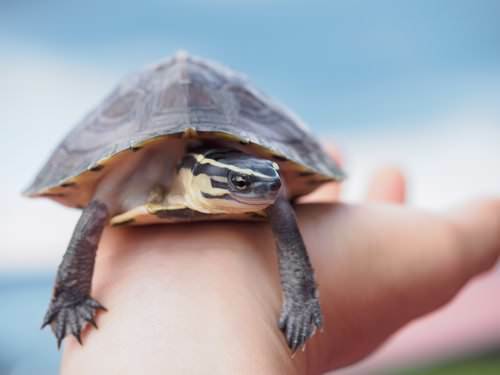 As you are learning the ropes of caring for your new pet, you can use these tips as a general box turtle care sheet that will give you and your turtle a firm foundation for a healthy future. 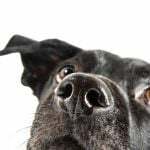 reputable rescue center, pet store or private breeder. While four states name a box turtle species as its national reptile, laws are still strict regarding their capture from the wild or even habitation in captivity. If you have the resources locally, it may be beneficial to search for your box turtle first in local rescue shelters and private breeders. In this way, you have the best chance of bringing home a healthy box turtle that is already well situated to thrive in your care. make sure you are up for the challenge! specialist who can treat your box turtle. Many new box turtle owners don’t find out until an injury or illness erupts that the local veterinary practice is neither trained nor equipped to treat exotic pets such as box turtles. For this reason, you should search for a local exotic veterinary specialist before you even consider bringing home an exotic pet such as a box turtle. Box turtles are considered to be a relatively hardy turtle species overall. However, just like any other pet, box turtles can get sick and have health issues. It is important to know what to look out for, especially if you are a new box turtle owner. 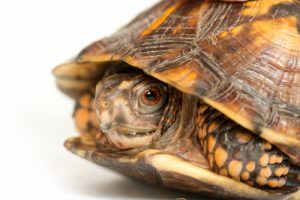 We’ve compiled a list of the most common things that can make your pet box turtle sick. Before getting a box turtle as a pet, you should make sure there is a local exotic pet veterinarian, experienced in turtle care, in your area. If you notice any of these signs of illness in your box turtle, bring your pet to the vet to get checked out. 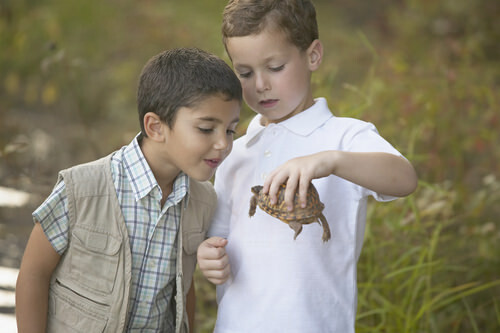 Something we recommend is to start a turtle log for your new pet turtle when you first bring it home. Note habits, behaviors, favorite foods, elimination schedules and anything else that can give you a sense of what is “normal” and what is not normal for your turtle. This will help you overcome your learning curve as you learn to take care of a turtle so you can quickly spot the signs when all may not be well. You can then get your pet turtle the vet care it needs right away so a small health issue never becomes major. Daily access to both land and water within its turtle tank is important! You will also want to make sure you offer the right size habitat for your growing box turtle. A full-size box turtle will range between four and eight inches, depending on species. 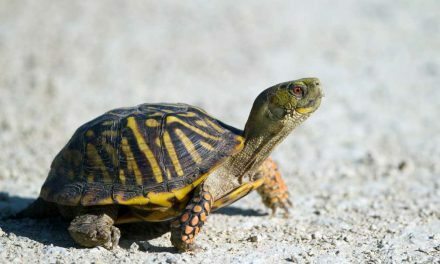 The general habitat guidelines suggest a turtle tank of at least a minimum of 40 gallons to house one adult box turtle. But your turtle certainly won’t complain if you offer an even larger enclosure! Make sure your turtle can easily climb in and out. Your box turtle is technically a land-dwelling member of an aquatic turtle family. For baby box turtle care it will be important to provide sufficient, safe hiding areas to satisfy your young turtle’s need to hide. 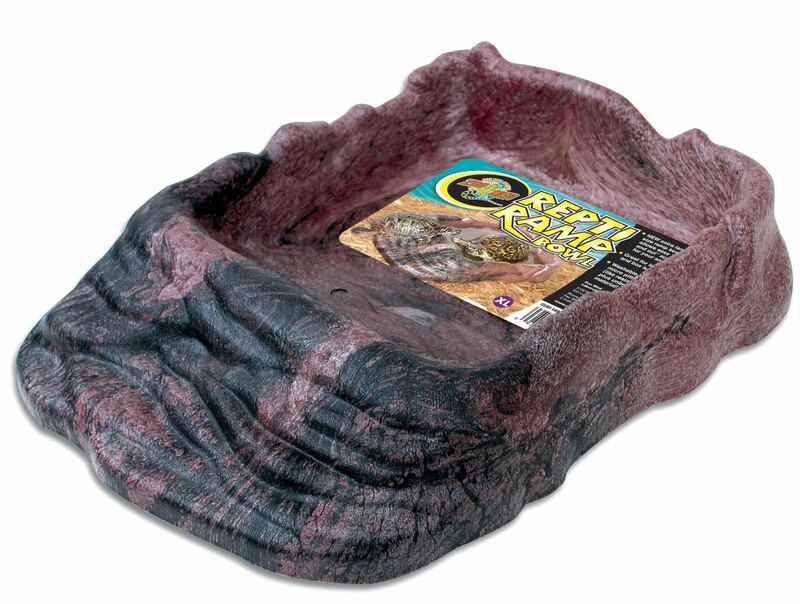 For best results, place at least one reptile cave on the warm side of the enclosure near the primary heat source. 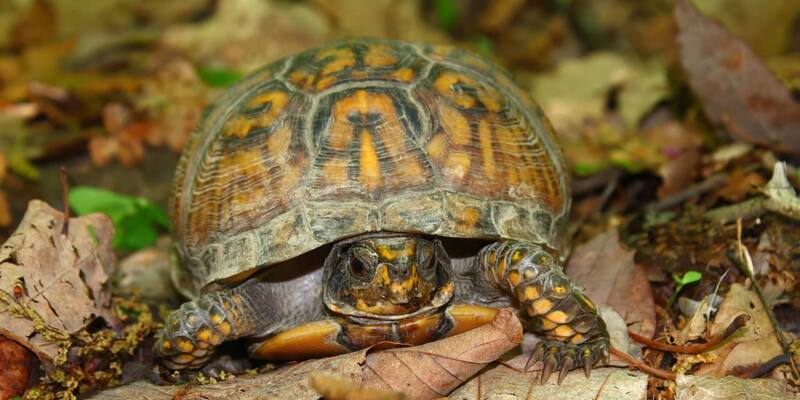 When it comes to habitat setup, box turtles are strong, dexterous and intelligent. This combination makes for a great pet and,/strong> a great escape artist. For this reason, your turtle enclosure – whether indoors or outdoors – must be fully escape-proof. The enclosure should include walls high enough that your turtle cannot climb over, and watch for any stepping stones that your turtle could use as an escape. 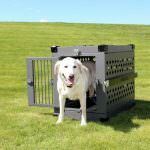 In addition, placing a wire or metal mesh cover over the top will make the enclosure extra hard to escape. Inside your box turtle’s habitat, provide a large shallow dish filled with non-chlorinated spring water, dechlorinated tap water or filtered water (NEVER use distilled water). For the habitat floor, use a substrate such as a coconut fiber along with sphagnum moss, both of which retain moisture and humidity well. Keep the substrate thick since your box turtle will likely enjoy digging in it. 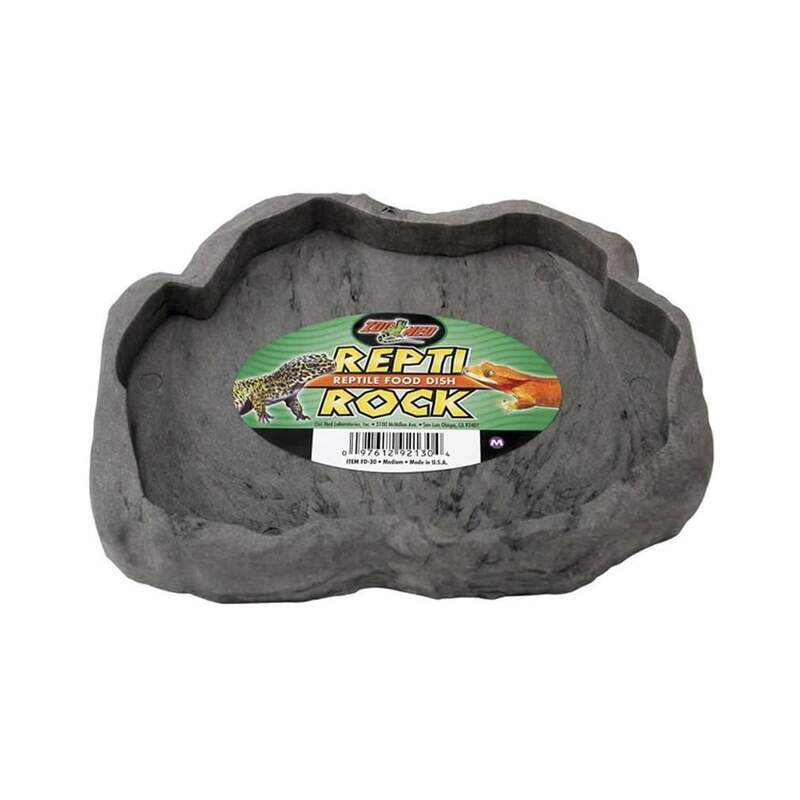 You can also add some flat river rocks for a more challenging environment and to keep your turtle’s claws neatly trimmed. Box turtles are energetic and active. Therefore, it is best to keep the overall décor simple – otherwise, you may find yourself cleaning and rearranging daily, if not hourly. Within the habitat, you will want to offer a warmer area (80 to 85 degrees Fahrenheit), a cooler area (75 to 80 degrees Fahrenheit), and a basking area – one spot that maintains a temperature of 90 to 95 degrees Fahrenheit. Adult box turtles can tolerate temperatures as low as 60 degrees Fahrenheit, but babies cannot tolerate any less than 70 degrees. 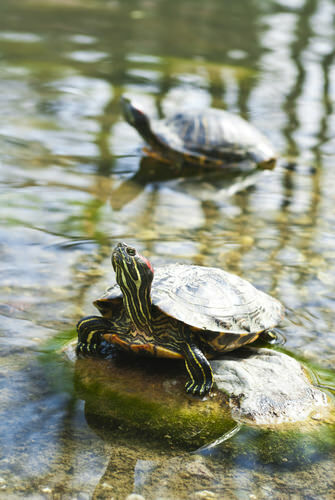 You should aim for around 80 degrees – slightly warmer for a baby or juvenile turtle. In addition to the full spectrum UV-A/B bulb, which will provide the critical UV rays along with some heat, you may want to add a ceramic heat bulb (emits heat but no light) and an under-tank heater graded for your type and size of the enclosure. One way to automate climate control, which will be especially important when you have to be away from home, is to use thermometers and timers. If you need to be gone overnight, you can use a light/heat strip to keep your box turtle’s tank at the right temperature and humidity levels while you are away from home. Investing in an infrared digital temperature gun can spot-check any area to see exactly what the temperature is! Maintaining the right level of humidity. Your turtle will also need access to humidity. You should use humidifiers, moisture-retaining substrate (sphagnum moss, coconut fiber, et al.) and other help as needed to maintain the humidity continuously in your turtle tank at between 60 and 80 percent. A thermometer/hygrometer with probes can be used to measure humidity on an ongoing basis. a full spectrum UV-A/B light source. If your turtle is indoors, you will need to provide a full spectrum UV-A/B light source to mimic the natural light of the sun because it is not enough to only turn on a nearby lamp for light and heat. 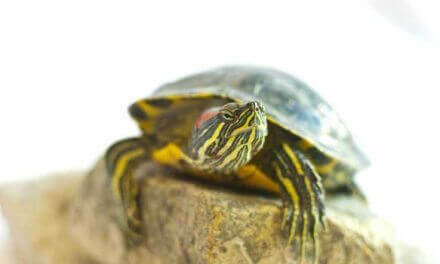 Your turtle needs the UV-A/B rays for sufficient calcium absorption to keep its shell healthy and strong. If your box turtle is primarily housed outdoors in a predator-proof enclosure, you won’t need to provide this type of light source as long as your pet has unobstructed access to natural sunlight in a portion of its enclosure. Lastly, don’t forget to change out the UV light bulb every six months to be sure the UV-A/B rays remain at full strength (after six months, while your bulb may still appear to be functioning correctly, the amount of UV will begin to decline rapidly). A box turtle is an omnivore, but protein will always be a favorite food source. Monitoring your pet’s diet is useful to ensure the proper percentages of protein and vegetation depending on age. A baby box turtle needs approximately 70 percent protein and 30 percent vegetation. While, a juvenile or adult box turtle needs equal parts protein and vegetation. You can supplement your pet’s diet with commercially prepared turtle foods, but make sure natural pure protein and vegetation represent the majority of meals. Pure protein sources can include live or freeze-dried worms and insects, plus puppy chow, canned tuna or salmon and hard-boiled eggs. Vegetation can include dark leafy greens (e.g., dandelion, collard, mustard kale) but no spinach, apples, berries, kiwi, and melon. Box turtles also like fungi and mushrooms from your local grocery store. Be sure to sprinkle a calcium with D3 supplement and a high-quality multi-vitamin supplement on your turtle’s food for the full complement of vitamins and minerals required for health. A turtle bone provided can aid as an additional supplement. By offering meals on a flat rock surface, you can also help your box turtle keep its beak trimmed. Thesingle most difficult challenge you will tackle is supervising its annual hibernation. While not all pet turtles hibernate in the wild, box turtles do. If your new pet is a baby turtle, you won’t have to address hibernation for at least its first three to four years of life. Box turtles housed indoors may not hibernate since temperatures will not indicate “winter” has arrived. And if your box turtle is underweight, ill, or too young (as determined by your exotic vet) you should not permit hibernation. 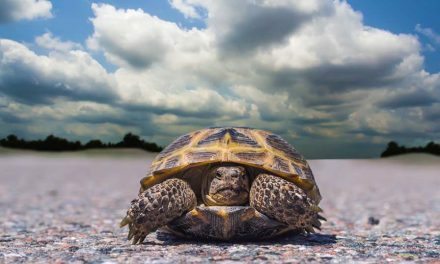 The temperature suitable for hibernation for indoors will include letting the temperature grow colder in and around your turtle’s hibernation area (a garage or basement is a good place if possible). If you have a healthy box turtle housed outdoors or even an indoor turtle displaying the signs of approaching hibernation (e.g., eating less, lethargy), you should have your exotic vet do a pre-hibernation health exam to verify that your pet is healthy and strong enough for supervised hibernation. All turtles may tend to look alike (shell, claws, cold-blooded, et al. ), however, they often have vastly different care requirements and health sensitivities. While turtles are potential carriers of the salmonella bacteria, other types of parasites and bacteria can differ greatly between species. For this reason, as well as many others, never keep turtles of different species together in the same enclosure. Supervising any new box turtle in your pet’s enclosure is beneficial since no two turtles (just like no two people) are guaranteed to get along! NOTE: Don’t ever leave your box turtle unsupervised around young children or other pets! In the wild, your box turtle will likely roam quite a bit during each day while hunting for food (although box turtles as a species show a remarkable affinity for staying in the near vicinity of their birth site throughout their lives). Now, in it’s enclosed shelter, your turtle will rely fully on you to keep its home clean and sanitary. For your turtle’s safety, you should pick your cleaning supplies with care. Plain water, food-grade white vinegar, and a mild unscented Castille soap are the best choices. For sterilizing, you can use a VERY mild solution of water with a bit of diluted bleach, but be sure to wash the item(s) being sanitized thoroughly with plain water before placing them back in your pet’s enclosure. To make your job easier, check your turtle’s area daily and remove any visible waste matter. Change out substrate as needed and be sure to remove daily and uneaten food altogether. 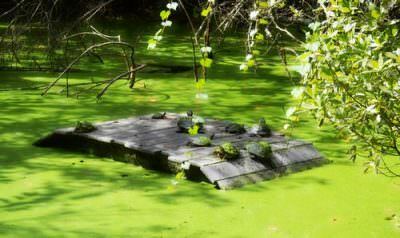 Lastly, change the water at least daily if not more often (turtles often seek water to soak and eliminate in, so don’t be surprised if your turtle tends to treat its pond as a toilet!). In this way, you should only have to schedule full habitat cleanings for every 1 to 2 months as needed. take the time to select the perfect new family. Finally, regardless of how well you plan ahead, the only thing that is certain in life is uncertainty. So if you do find that, at some point in the future, it becomes necessary to rehome your box turtle, you will want to do so with great care. Remember to NEVER even consider bringing it “back to the wild.” Your box turtle will be bonded to its birthplace (which will be your home if you got it as a baby) and will likely wander aimlessly in the wild looking for its home until it dies from exhaustion. 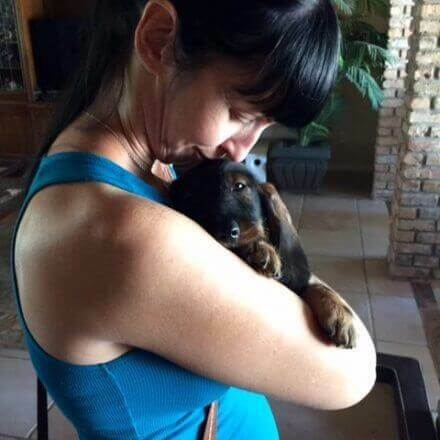 Rather, seek out a reputable rescue shelter or local breeder to see if they know of an interested new owner. Or advertising on local pet placement websites can be a useful way to find a perfect match! Box turtles that are well cared for and wanted in captivity can live for 50 years or longer. 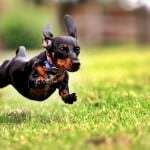 By taking the time to find just the right new home for your former pet, you will offer it the best chance of a long and enriching life.